Park Right DC is intended to be a decision-support tool, not a decision-making tool. It can serve as a resource to inform discussions as users weigh the factors affecting parking use and consider how much parking to provide, but it cannot provide definitive answers about specific future policies or developments. Transportation Demand Management (TDM) plans – TDM includes programs and policies to encourage non-auto travel. Things like free carshare or bikeshare memberships, transit passes, real-time transit information screens, and bicycle parking can reduce parking utilization by encouraging the use of non-auto travel. Market segmentation – The tool assumes a building is occupied by “average” residents. But a building can be specifically targeted to a particular segment of the population – Millennials, families, short-term residents, etc. – with non-average car ownership characteristics, which would impact parking utilization. The model used in the calculator is statistically very strong, but it is important to note that, like all models, there is always error in estimates (the standard error for this model’s estimates is 0.11). Limitations on our data collection also affect the model’s accuracy. Observed parking mostly included supply that was off-street and on the same property, unless additional parking provided for residents was noted by property managers. However, the sites selected for the study were screened based on building age and available parking supply, in order to control for potential undersupplied parking that could result in spillover. The result was sites studied whose predominant parking could be measured through parking counts, rather than those where undefined off-site parking would have resulted in an underrepresentation of parking use. 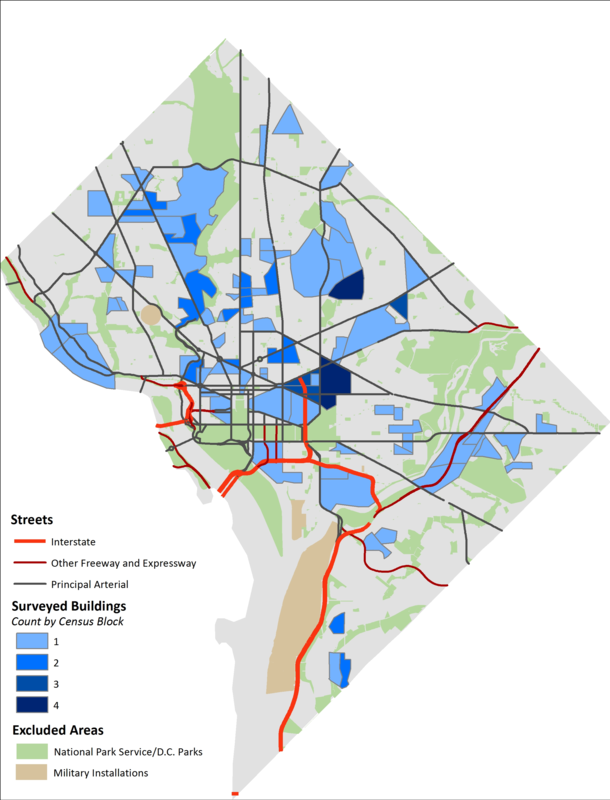 To ensure confidence in the model estimates, only properties in DC are covered by the calculator. The sample utilized for data collection covered a wide range of nieghborhoods, but all in the District of Columbia. Therefore, the coverage for which model estimates were calculated is limited. The following map shows that aproximate location of the surveyed buildings.